So, even though I know posting things here is the curse of never completing said items, I have so much bouncing around my head right now that I really need to put it somewhere, just so I can focus on all the things I need to make first. So here is a long meandering list of all the things I am wanting to sew at the moment. Ok, so I was going to use this pattern to make my entry for the Bargainista contest, but, since it overlapped so much with the Sudoku contest, it just didn’t happen. I’m still going to make this project! But I think I might make a “plain” version of the bomber first, before I embark on the much more labor intensive version for my Bargainista knock-off. I actually already muslined the pattern (I mean, I did make a valid attempt at getting this ready for the contest), and so the pattern should be ready to go. Doing a plain version will be great to see if all the adjustments I did to the sleeves will work out. Even though I was once a stanch jumpsuit hater, I’m now really on board with this trend. I’ve been obsessed with McCall’s 7577 since it came out, and I found the perfect fabric at Jo-Ann Fabrics when I went to pick up the pattern, and the perfect coordinating lace at Fancy Fabrics in LA, so now it has to become a project. I’m just torn on weather I should be doing culottes or extending the pants to a full length version…. Feel free to share any thoughts on this in the comments! I’ve got 2 cosplay ideas I’m super hot to put together right now – one a Doctor Who mashup, and one from SyFy’s The Magicians. Looking to have these done my September, though if I could get one ready by July’s SDCC, that would be Amazing too. 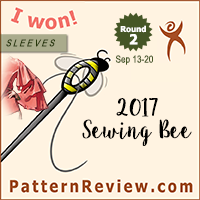 Looking ahead, I’m interested by participating in the Jeans Contest (but timing-wise, it’s not going to happen), the Travel Wardrobe Contest, the Sewing with Lace Contest, and the Pattern Stash Contest. Looking at the timing of it all, the Travel Wardrobe *might* happen (depending on requirements), but I’m probably more likely to be able to do the Sewing with Lace (oooh, and do my jumpsuit maybe! All the sewing birds with one stone!). Pattern Stash overlaps with nationals, so… Hmmmm. 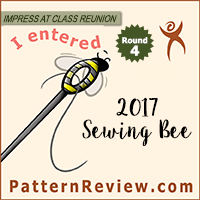 The next batch of contests I’m interested in don’t start until fall (looking at you Sewing Bee), so I’ll cross that sewing bridge when I come to it. So I really love the pants I made for the Wardrobe Sudoku Contest, but they are way to warm for summer. So, clearly, I need to make another pair in the other fabric I bought from Mood. Clearly. I need to not look like a ragamuffin child if I’m actually going to skate this year. This should probably be priority #1. Last year I made a prototype padded jacket, which has been working great, but looks like a cobbled together mess. Time to up the game a bit and make something a little more cohesive. I have a lot, but they are needing replacing soon methinks. I have lots of patterns to try, I just need to do it. Pretty self explanatory. Will require a trip to IKEA, an order on Amazon, several hours of manual labor, an extension cord, and some new thread racks. Also will be totally disruptive to all the sewing I want to accomplish, so timing will be key here. Might be a just-before or just-after nationals thing. I’m thinking August sounds good. So… yeah. That actually doesn’t seem too bad (seeing as how these are my plans up to September) except that I’m not actually actively working on any of it at the moment. Definitely priority #1 is skating costumes, followed closely by the sabering jacket and workout clothes. Desire #1 is probably a close face-off between the bomber jacket and the McCall’s jumpsuit. Hopefully I can find time to work on all of these things over the summer, though I wouldn’t be surprised if I had to choose just one or two to make for myself. Sigh. Those pants are very flattering on you! I’m waiting for the sun to come back so I can photograph my M7577 romper. I really love it EXCEPT for taking it off. I’ve read two reviews and don’t think anyone mentioned it being hard to wrangle out of so maybe I just didn’t leave enough ease (though I sewed my normal McCalls size…). I did the ruffle shorts and made it sleeveless. So cute. Just remember to watch that crotch curve. I normally shorten the front and didn’t. It’s okay. I normally add an inch to the back. I added an inch and it’s *just* okay. I should’ve added a bit more to the back rise to drop the crotch seam a bit. It’s a nice pattern and I say go for it! Can’t wait to see the bomber. I love the fancy ones!! Thanks for the tips! It’s been so long since I’ve used McCall’s – it’ll definitely be a muslin first sort of project! Can’t wait to see the bomber! The romper looks really cute too! I used Vogue to make a shirt last year, and never again without a muslin. Didn’t like the fit at all. Haven’t tried McCalls yet. I’m just on the last stages of a Burda jacket, something I’ve never tried before. It’s unlined and I wanted a lining. God I’m a sucker for punishment. Those will look so great on you!